Outside Oryana Food Co-op at Lake St. and Tenth, just beyond the old railroad yard, a stand of grass grows far taller than my six-foot frame. The stalks are sturdy and straight, colored with maroon, gold, and a touch of blue at the nodes where the leaves come out. They grow in the rubble of a formerly active railroad, amid the cinders, stones, broken glass, and pieces of coal of the roadbed. Alongside the tallest grasses is a shorter species which looks much like the larger, but reaching only a bit above my knees. It definitely plays second fiddle to its larger cousin. 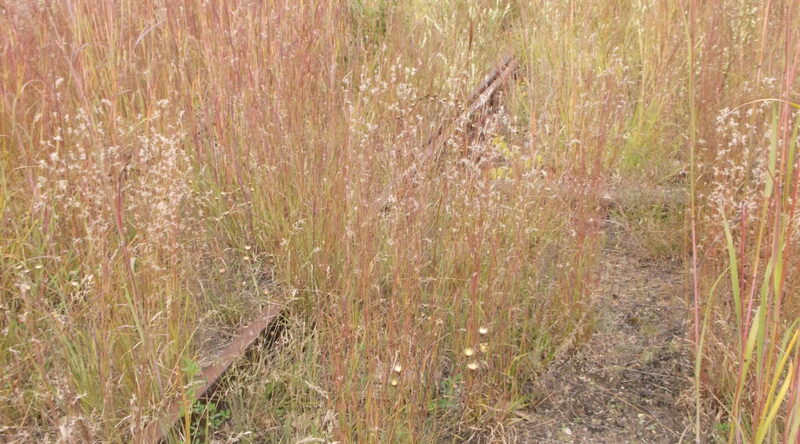 Little Bluestem (Schizachyrium scoparium). Image courtesy of the author, taken in October 2017. I know these grasses. 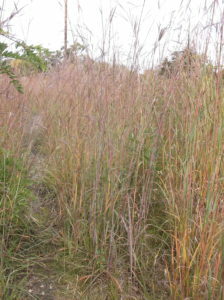 The larger is Big Bluestem (Andropogon gerardii), and the smaller—appropriately—Little Bluestem (Schizachyrium scoparium). Both are native to Michigan, the smaller species quite common along interstate highways and sandy, well-drained fields in locations where farming proved nearly impossible decades ago. Big Bluestem is harder to find: the most likely place in Northern Michigan to find it is near Lake Michigan among the dunes. Both grasses are prairie species. As components of that ecosystem, they depend upon environmental disturbance for their survival, that taking the form of occasional drought, fire, and windblown soil. In Michigan we do not have good examples of prairie ecosystems. Perhaps the oak openings around Kalamazoo and the sandy, unstable soils near Lake Michigan come the closest, but they lack many prairie species present further west. Sleeping Bear dunes has areas heavily populated with prairie grasses, especially Big and Little Bluestem. Big Bluestem (Andropogon gerardii). Image courtesy of the author, taken in October 2017. 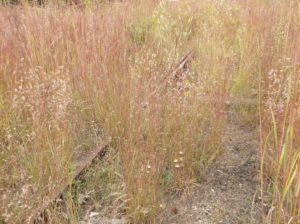 If prairies are the natural habitat of these grasses, then why are they found along railroad tracks? Two reasons occur to me: first, railroads do away with woody plants growing near the tracks through pruning or herbicides. With no trees to shade them out, grasses have the advantage. The second reason has to do with fire. Before the days of diesel engines, fires along railroad tracks were common as hot cinders escaped the smoke stacks of steam engines. Fire would spread from the tracks, sometimes starting wildfires that extended for miles. Of course, lightning causes such fires, too. Michigan does not have the endless oceans of grass rippling in the wind as the Dakotas or eastern Montana do. 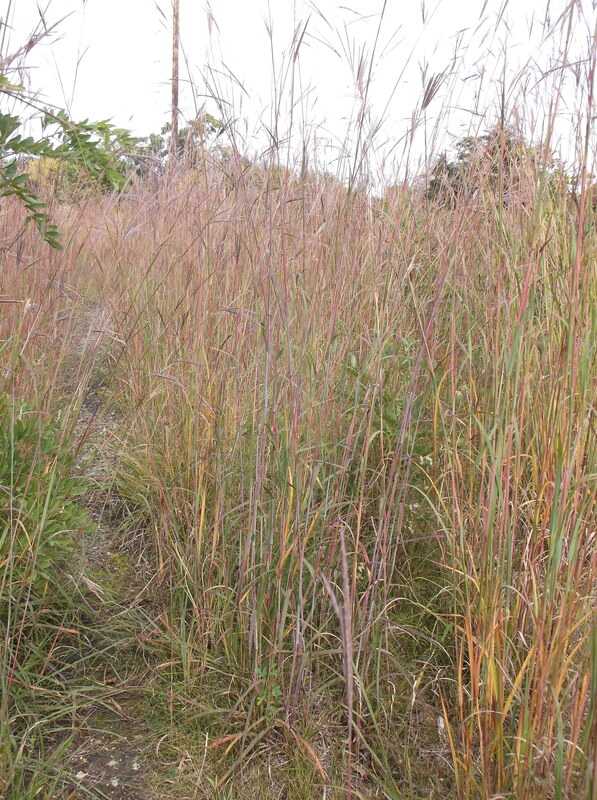 Buffalo did not wander among stalks of Big Bluestem that grew shoulder-high to those animals. The sky did not spread to the far horizon, creating a sense of both immensity and emptiness as Western writers describe for us. Instead, here the hills and trees make for a more closed—some would say, friendly environment. Still, in small places and large expanses all around—by old railroad tracks and in sand dunes—we get a hint of the prairie further west, only we must search hard to find it. 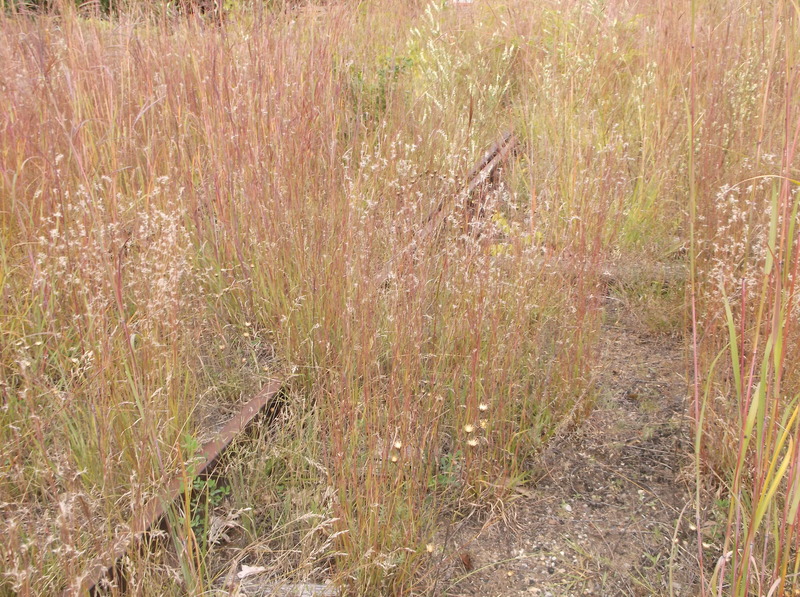 Look along railroad tracks to find Big and Little Bluestem before the snow presses their stalks to the earth.